I’m Helen, I’m 25 and I live in the very beautiful North Devon. 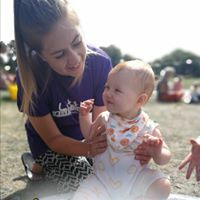 I am currently studying towards my foundation degree in Early Years. When I first saw a video about Little learners messy play, I was so intrigued! 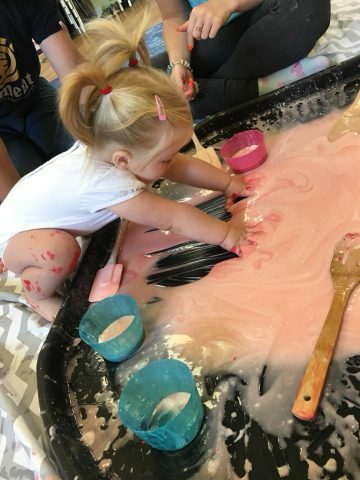 I love the idea of children learning the first stages of mark making, whilst having fun and getting messy! I am really passionate about children’s learning, and have a good knowledge of the EYFS, i love using different sensory activities to encourage mark making. 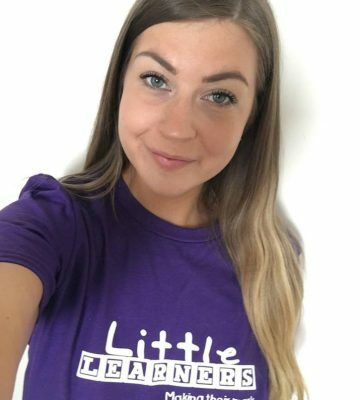 I am so excited to start my journey with Little Learners, to help children learn and develop, and have some fun along the way! Our mission is simple: encourage every child to make their mark! We provide exciting preschool classes where your child learns how to mark make through play. 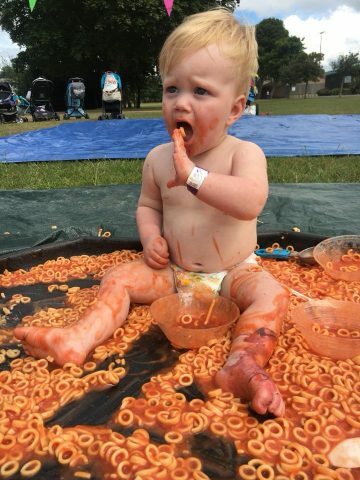 If it’s fun and it’s messy – it can’t be learning…can it? Wrong! Babies and young children learn best through play. Mark making is the first step towards writing! 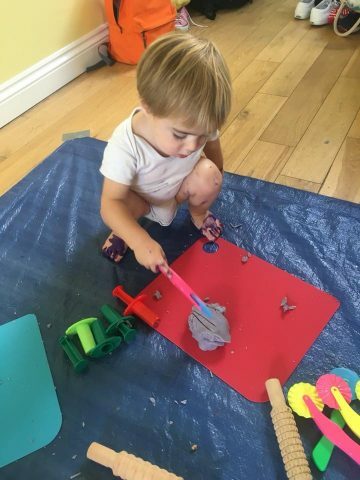 Mark making is a huge part of your child’s learning journey and one of the outcomes of a prime area of learning – Physical Development – in Early Years Foundation Stage Guidance (birth to 60 months). When your child starts to make scribbles, patterns and shapes, this is ‘mark making’. It is the first step towards writing. Your child explores, experiments and expresses themselves through the marks they make. They begin to assign meaning to their marks, which leads to creativity and exploration. Exploring different textures, materials and grabbing various apparatus will help your child get ready for writing. 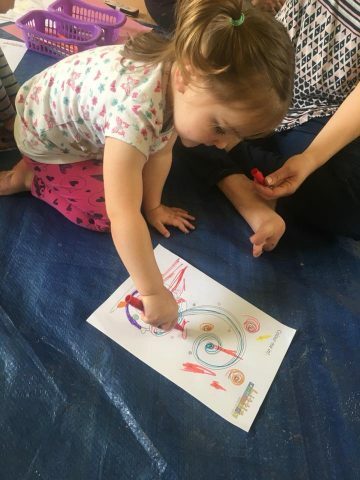 Encouraging your child to use their hands, fingers, feet and toes to make marks will strengthen their core muscles and develop their gross and fine motor skills. These skills are vital for holding and controlling a pencil and letter and number formation. Children can mark make in many different ways: pen and paper, painting, ‘messy play’ or even drawing in the sand on the beach. All of these provide opportunities to explore a wide range of tools too such as paintbrushes, chalks, pencils and their bodies. The benefits of mark making are clear. Your child’s fine motor skills will develop and strengthen in preparation for writing. I will be running classes in North Devon, so come and join me on this exciting journey! Just been to your session at Bideford Park and must say it was absolutely brilliant! Very well organised and lots of fun educational activities to play with! Would highly recommend to any one with a child of any young age as they cater for all! A fab time! Will definitely be back! 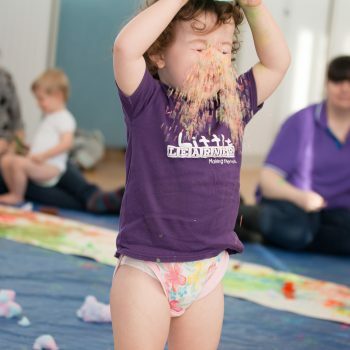 I took my daughter as she hates having dirty hands etc…first session of Mark Making and she is covered from head to toe in paint, rice, cake mix and eating a dry Weetabix. Helen is welcoming and warm, we had such a great time and am super happy we booked for the term. Bring on next Monday! 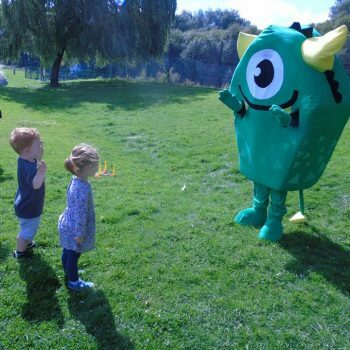 We can tailor each party to your child’s interests and provide a range of resources to suit your needs and budget. 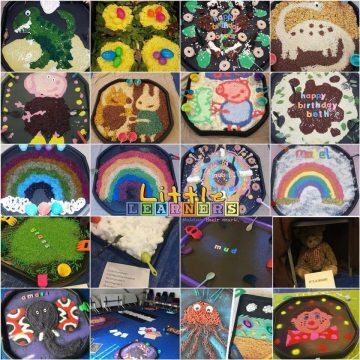 A cake smash party is very popular and we have also catered to themes such as Trolls, Moana, Rainbow, Peppa Pig, Farm, Unicorns, Dinosaurs, Marvel Superheroes and many many more. 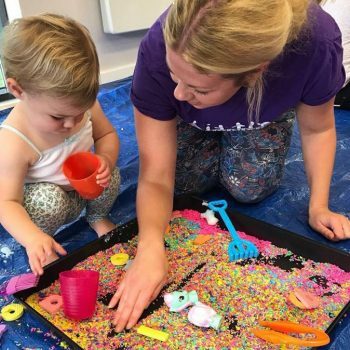 The party room typically will be set up with themed messy trays, sensory play, painting and drawing stations, play dough, crafts and a dance area. 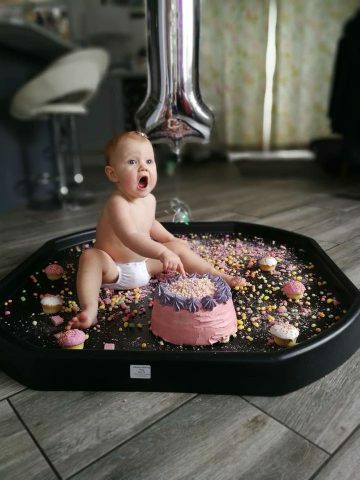 Our party packages start from £120 for up to 15 children – we bring everything required, we set-up, deliver the session and then clear up all the mess afterwards, all you have to do is tell us the venue – what could be better?